If you follow us on Instagram (@dogsthathike) chances are you’ve seen us post the P.L.A.Y. Outdoor Dog Tent at least once. If you’re reading this review you’re probably wonder “should I FINALLY get it?” (the answer is yes) or “what the heck is that for?” (we’ll get to that below). Next to variations of “OMG so cute” the most common comment we see from folks is that they wouldn’t use a dog tent as they prefer to have their pup sleep in their tent with them. We’ve got a stage 5 clinger so we totally understand where you’re coming from but that doesn’t stop us from owning, and regularly using, our dog tent. Dog tents are not for everyone but are more useful than you would expect. Our most common use? A nice quiet place for our pup to relax when spending some time in the wild. It appeals to our pups natural instinct to den, allowing for some much needed rest while keeping our tent free from chaos. Our pup enjoys her tent so much she can often be heard snoring in it while the rest of us are enjoying food and drinks around the campfire. 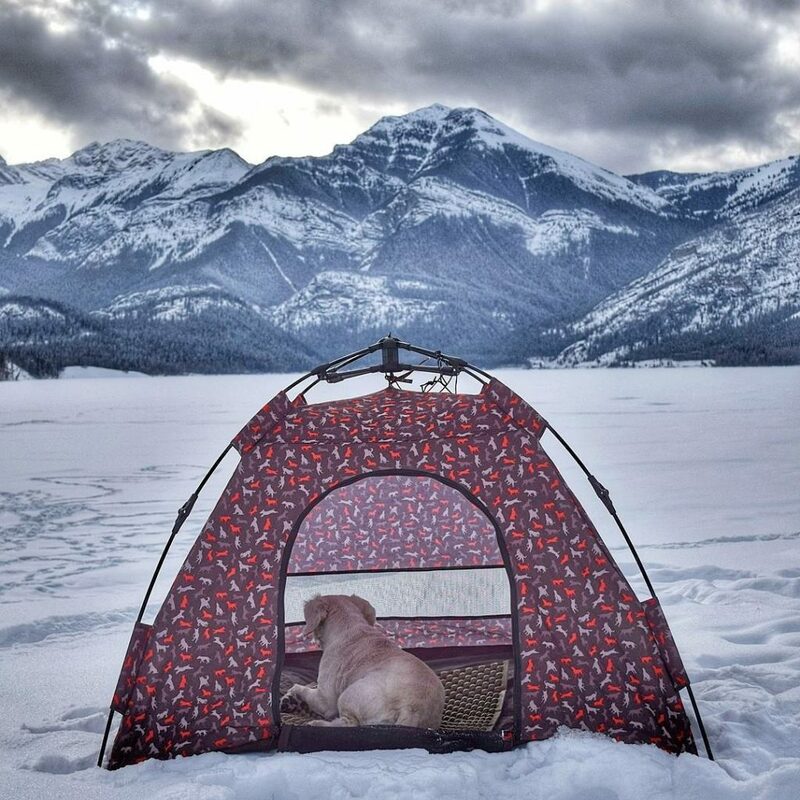 While our pup took to the tent right away, other Trail Testers found that it took a few tries for their pup to understand it was a place they could call their own. While it is primarily wildlife concerns (i.e. that our pup would take off after something) that keep us from using it overnight, there are many others who this would be well suited to. Our friends pup never adjusted to sleeping in a human tent, not because of a confined space but simply because he doesn’t enjoy sleeping that close to humans. Setting up a pup tent has allowed them some comfort to know that their pup has shelter from the elements. Additionally, those who hammock camp know that sleeping in a hammock with your pup overnight is not always the idea situation. 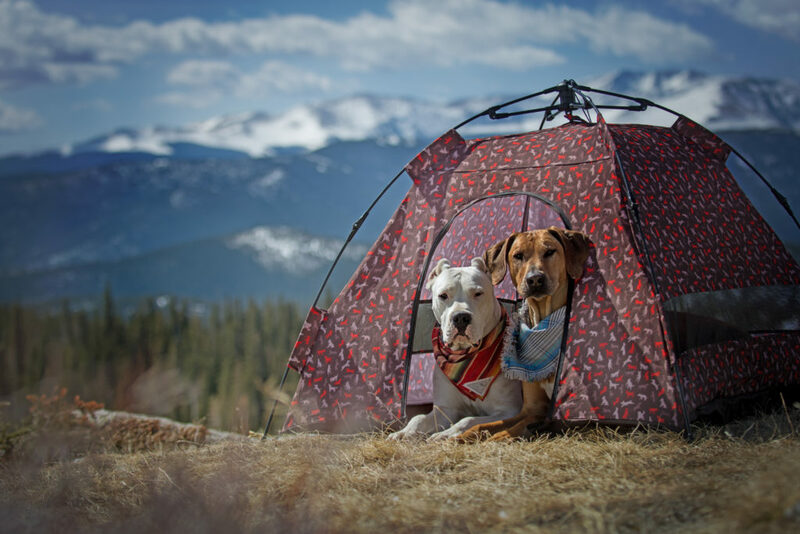 Setting up a pup tent under your hammock again provides some shelter for your pup and may allow them to have a more peaceful rest. The P.L.A.Y. 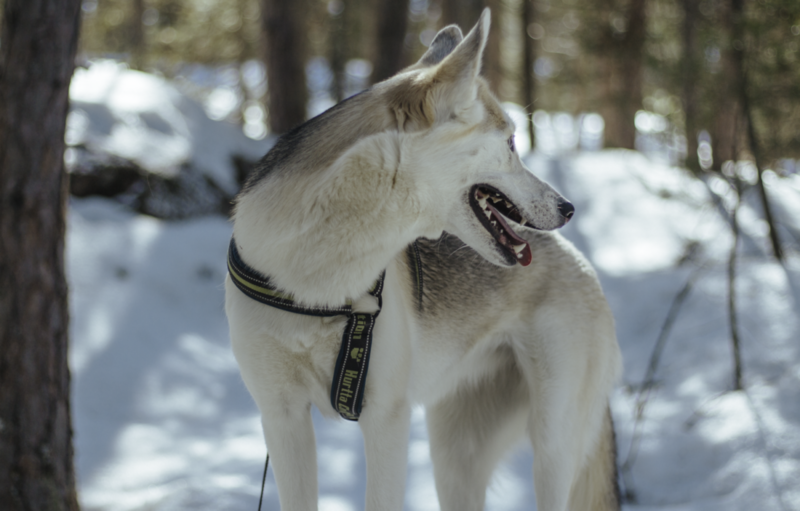 Outdoor Dog Tent is a “one piece” design where the poles are permanently attached to the tent making it so easy to set up you’ll be wondering why all tents aren’t made this way. When you take the tent out of the bag you fold it open and you’ll find cords in the middle – all you have to do is pull the cords and the tent pops in to place! We love the simple approach as it means no fussing with trying to get the right poles in the right places – it came in really handy when we were in the snow! The poles are made of a durable plastic and the tent comes with pegs should you need to stake it down. We’ve had this tent out in moderately wind and properly staked out it stood up well to the elements. When opening the tent the high quality craftsmanship of the P.L.A.Y. tent is immediately noticeable. Every small detail is considered to ensure that this tent will last with even the roughest of pups. 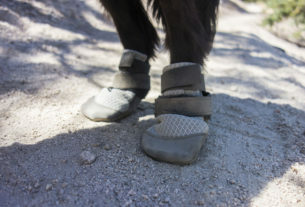 It is primarily made of a durable and high performance 600-Denier PE fabrics that is both waterproof and certified UV resistant that comes in either Mocha or Vanilla. Having used this tent in both rain and snow we can say that it holds up much better other tents we’ve tested and definitely lives up to its classification of water resistant. To keep it smelling fresh there are thick durable mesh panels on three sides and a thick durable mesh door. 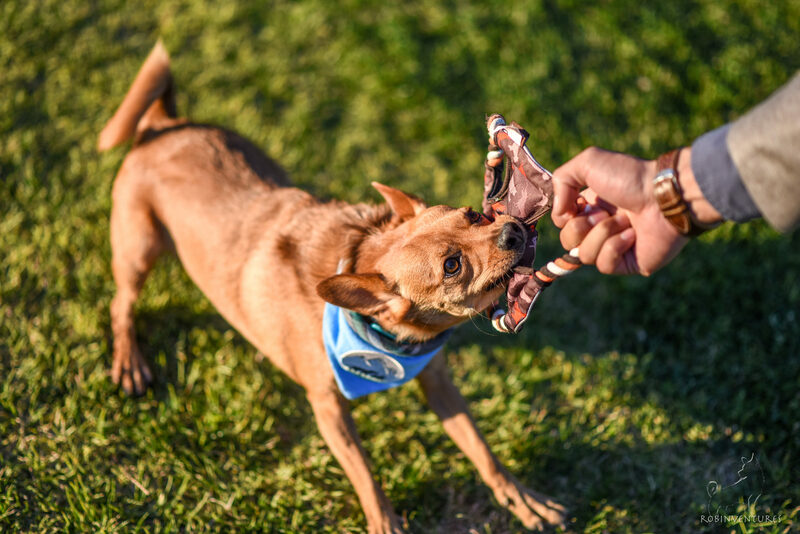 The door smartly rolls down and fastens under the tent so your pup can easily get in and out without the door getting in the way. Not only does this allow smells to dissipate but it allows air to flow through keeping it from getting too hot on a warm day. The tent comes in a carry case that is made of the same material as the body of the tent. Unlike some human tents, there are no issues fitting it back into the carrying case once it’s been opened and used. Because the poles are attached it may take you a few tries to figure out how to properly fold it up but once you’ve got it you’ll get it every time. The carry case as well comes with a long strap down the side making it easy for you to hold in your hand, over your shoulder or strap to your pack. The pole design and materials used put it on the higher end of lightweight – it comes in at 4.63 pounds which is very easy to carry in to a regular campsite or picnic but might not be something you bring along on a backpacking trip. While it doesn’t pack down as small as some of it’s competitors what it lacks in compactness it makes up in ruggedness. We’ve been using this tent for a few months and it still looks as new as the day we received it. Part of this is due to the fact that it is extremely easy to clean. When we had it out in the rain it picked up a bit of mud and all we needed was a damp cloth to wipe it clean. Another fantastic thing about this tent is it’s built for big dogs! 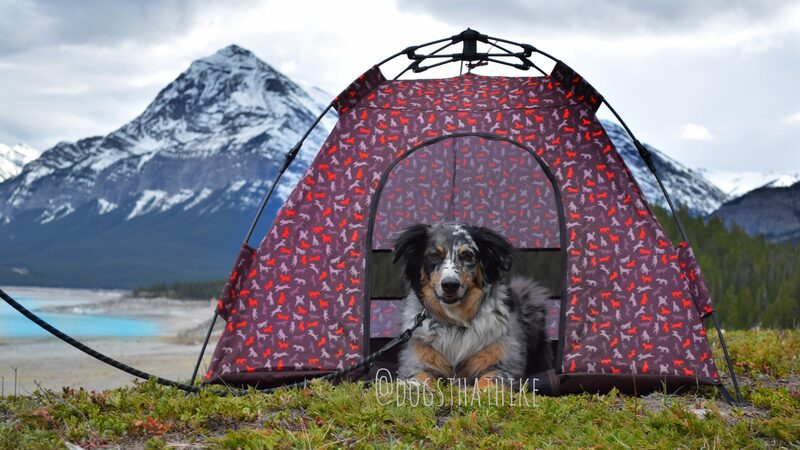 One of our contest winners @koda_and_rue received this tent and both of their large pups were able to comfortably fit in the tent. When we set it up we were blown away with how spacious it looked so of course we humans had to give it a try ourselves. One 5’9″ human crawled in and was able to comfortably sit up straight and only take up half the tent – extra bonus points for the tent not only being big enough for big dogs but in a pinch fitting a human. Overall we love this tent and will be regularly using it when we go car camping or as a shelter for our pup on day trips (e.g. a picnic or a BBQ after a hike).